La Marŝalo Ney ĉe la Batalo de Eylau. La "Marŝalo de Imperio" Michel NEY (Franclingva prononco: ​[miʃɛl ˈnɛ]), 1a Duko de Elchingen, 1a Princo de Moskvo (10a de Januaro 1769 – 7a de Decembro 1815), populare konata kiel Marŝalo Ney, estis franca soldato kaj milita komandanto dum la Francaj Revoluciaj Militoj kaj la Napoleonaj Militoj. Li estis unu el la originalaj 18 Marŝaloj de la Imperio kreita de Napoleono Bonaparte. Li estis konata kiel Le Rougeaud ("ruĝvizaĝulo" aŭ "ruĝharulo") fare de siaj homoj kaj kromnomita ankaŭ le Brave des Braves ("la plej kuraĝulo el kuraĝuloj") fare de Napoleono. Atteridge, A.H. (2005). 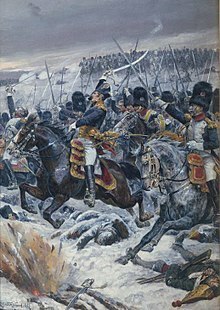 Marshal Ney: The Bravest of the Brave. Pen & Sword. Bellemare, Pierre; Nahmias, Jean-François (2009). La Terrible vérité: 26 grandes énigmes de l'histoire enfin résolues. Albin Michel. p. ~149. ISBN 978-2-226-19676-7. Chandler, David (1999). Dictionary of the Napoleonic wars. Wordsworth editions. Coustumier, Jacques Le (2011). Le Maréchal Victor. Nouveau Monde éditions. p. ~267. ISBN 978-2-36583-087-4. Gates, D. (2003). The Napoleonic Wars, 1803–1815. Pimlico. Gillespie-Payne, Jonathan (2003). Waterloo: In the Footsteps of the Commanders. Pen and Sword. p. 111. ISBN 978-1-84415-024-3. Howarth, David (1968) . Waterloo: Day of Battle. New York: Galahad Books. p. 132. ISBN 0-88365-273-0. Horricks, Raymond (1982). Marshal Ney, The Romance And The Real. ISBN 0882546554. Markham, J.D. (2003). Napoleon’s Road to Glory: Triumphs, Defeats, and Immortality. Brassey’s. Parry, D.H. (1901). Battle of the nineteenth century. 1 (speciala eld.). London, Paris, New York and Melbourne: Cassell and Company. p. 68. Alirita la 31an de Aŭgusto 2017. Roberts, A. (2005). Waterloo, June 18, 1815: The Battle for Modern Europe. Harper-Collins Publishing. Tsouras, P.G. (2005). The book of Military Quotations. Zenith Press. Ĉi tiu paĝo estis lastafoje redaktita je 17:37, 12 jan. 2019.